October 24, 2012  Syria's government has indicated it may accept a UN-Arab League proposal for a four-day ceasefire during the Islamic holiday of Eid al-Adha. The United States is cautiously welcoming the news. October 21, 2012  President Obama and his Republican rival, Mitt Romney, face off in their third and final debate on Monday, this one focusing on foreign policy. They've sparred over Libya, China and Russia in the past and those are among the many themes they will likely debate as they try to put forward different visions on America's role in the world. October 10, 2012  Republicans on the House Oversight Committee want to hear why the State Department repeatedly denied requests for tighter security for U.S. diplomats in Libya before the deadly September 11th attack on the consulate in Benghazi. The State Department has been tight lipped on the issue. October 7, 2012  A Norwegian comedy duo managed something rare: to get concert goers cheering for a U.N. official. October 5, 2012  The U.S. is backing its ally Turkey — saying it was right to respond by twice firing on Syrian military positions after a Syrian mortar shell killed five Turkish civilians. The U.S. hopes the Turkish action and strong U.N. and NATO statements will deter Syria from any further provocations. September 29, 2012  Secretary of State Hillary Clinton says the U.S. will give another $45 million in aid to Syria, mostly humanitarian assistance but also some non-lethal equipment support for the opposition. The news came at the end of a week of speeches at the United Nations in New York, where many raised alarms about the bloodshed in Syria. NPR's Michele Kelemen reports. September 27, 2012  Israel's Prime Minister Benjamin Netanyahu and Palestinian leader Mahmoud Abbas addressed the UN General Assembly on Thursday. Netanyahu called for clear red lines on Iran. Abbas accused Israel of carrying out terrorist attacks by destroying settlements in the West Bank. September 26, 2012  Iran's President Mahmoud Ahmadinejad's addressed the UN General Assembly on Wednesday. His speech came at a time when Israel's Prime Minister Benjamin Netanyahu is urging the United States to join it in drawing clear lines that Iran's nuclear program can't cross. Amid Protests, Iran's President To Address U.N.
September 26, 2012  Iranian President Mahmoud Ahmadinejad gets his moment in the spotlight Wednesday at the United Nations General Assembly. But this trip is different than past visits. He's a lame duck president and comes to New York at a time when Israel is frequently raising the possibility of a military strike on Iran. September 25, 2012  President Barack Obama addressed world leaders Tuesday in New York City as he opened the UN General Assembly. September 25, 2012  The U.N. General Assembly opens at a time when U.S. embassies and consulates have been the target of protests across the Muslim world. Secretary of State Hillary Clinton has met with the presidents of Pakistan, Afghanistan, Libya and Egypt. She says one of her messages is that people in that region don't want to trade the tyranny of the dictator for the tyranny of the mob. 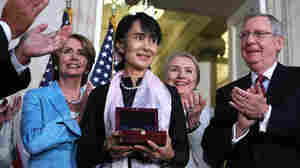 September 23, 2012  Burmese democracy activist Aung San Suu Kyi has been honored and celebrated on her first visit to the U.S. in 40 years. In various speeches, she's talked about learning to compromise with former military men in Myanmar's parliament who kept her under house arrest for years. September 21, 2012  An Iranian opposition group that has carried out terrorist attacks inside Iran is being removed from the U.S. State Department's list of terrorist organizations. Several Americans died in those attacks. The group known as the MEK has lobbied Congress, former U.S. officials and the media tirelessly. Word came on Friday that Secretary of State Hillary Clinton has agreed to delist the group. The MEK met a key U.S. demand by vacating the base in Iraq from which it operated when Saddam Hussein was in power and Iraq and Iran were sworn enemies. September 20, 2012  Recent anti-American protests in the Middle East have stoked debate over what the U.S. role in the region should be. The Obama administration says the U.S. will continue to engage with new political movements in the region. Some argue for more concrete goals.